The very first tapestry that Mags – Marguerite Stephens – wove, was based on an artwork by Cecil Skotnes. Her mother, Coral Stephens, a well-known South African weaver in her own right, saw the incised wood block on display at an exhibition at the Egon Guenther Gallery, Johannesburg in 1963 and told Skotnes that the image would make a wonderful design for a tapestry. 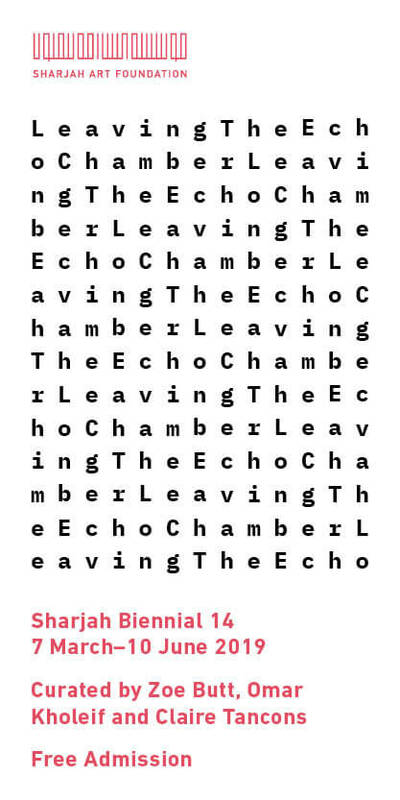 “Well, you weave it then,’’ he responded. “No I won’t”, she replied, “but my daughter will!” And the rest, they say, is history. 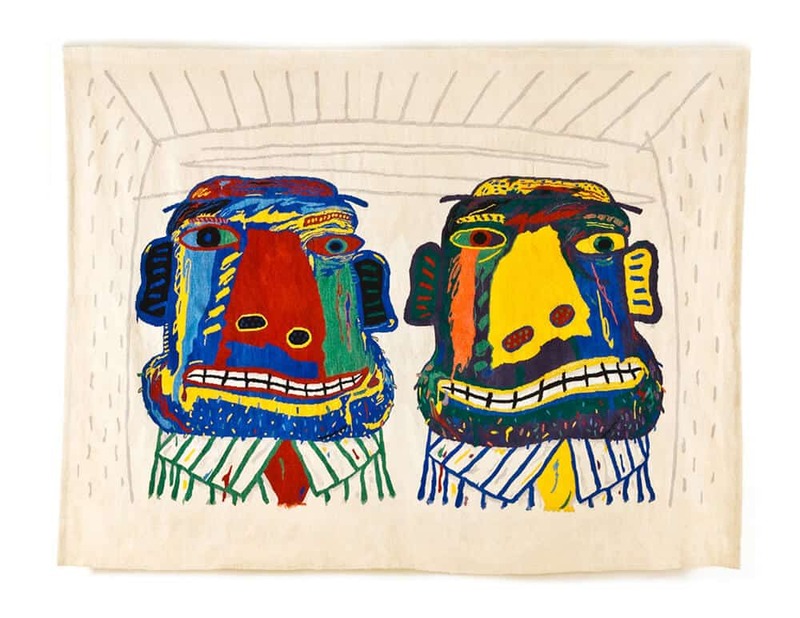 Skotnes made the cartoon, nothing more than a blown-up photo of the block, and Mags wove the tapestry on a high warped loom built by her mother specifically for the task. Skotnes exchanged his block for Mags’ tapestry, promptly sold the tapestry for R100, and gave her R50! Her career was launched. The tapestry does not exist anymore because it was woven with linen warp, which disintegrated many years later, but the Skotnes block which started the whole story still hangs in Mags’ house. William Kentridge, High Wire, 2017. One of three related designs known as the ‘Manet’ series. Mohair & cotton polyester, 2,16 x 1,58m. Photographer: David Ballam. Courtesy of Stephens Tapestries. Cecil Skotnes made many more designs for tapestries and the two of them collaborated for many years. It was during this time that he introduced her to Eduardo Villa, who was also interested in having his work translated into tapestry. Mags subsequently met Sydney Khumalo and Cecily Sash for whom she also wove many tapestries. She, in fact, became the resident weaver for the whole of the then Amadlozi Group of artists, under the wing of Egon Guenther. “All except Guiseppe Cattaneo,” she says, ‘’because his paintings were impossible to translate into a tapestry”. Cecily Sash and Judith Mason did not merely use an existing art work or painting to translate into a tapestry, but designed specifically with the weaving medium in mind. Initially, their tapestries were woven overseas in well-established weaving centres such as Aubusson and Felletin in France, or in Portugal, but increasingly, by South African weavers, such as Marguerite Stephens. On the other hand, a local weaving tradition flourished in such mission stations as Rorke’s Drift. The weaving, however, was done very differently and did not follow the format of a specific design. Women would, for example, visualise an idea through listening to a story or through discussion or through a personal experience and the images developed as the tapestry grew on the loom. These women worked spontaneously, unhampered by preconceived ideas about style and technique, and, as a result, their tapestries were naïve, robust and unconventional. Norman Catherine, Hodge Podge, 2015. Mohair & cotton polyester, 1.58m x 2.17m. Mags’ first loom was two meters wide, but it quickly became evident to her that this was not going to be big enough to fully amplify designs to the dramatic scale that she wanted. She commissioned Michael Fleischer, a sculptor, to build a three meter loom for her. Initially working on her own, Mags now employed a trainee weaver, Lilian Simelane who worked with her from 1970 until she retired to her home in Swaziland in 1998. Margret Zulu joined in 1978 and is now one of two head weavers in the studio, which buzzes with the energy of between ten and twelve women weavers and assistants on any given day. After Mags has determined the colours for each tapestry design she usually goes to the family farm in Swaziland where the wool is spun and dyed. Incidentally, Cecil Skotnes and Egon Guenther in the mid 1960s went down to the farm in Swaziland together and work commenced with Skotnes’ wood block series Stations of the Cross, as well as a tapestry commission for the local Anglican church in Pigg’s Peak. On a trip to Canada, Mags saw a five meter loom at the le Crerc workshop in Quebec, and she immediately ordered one which is still in use in the studio. She subsequently ordered a second five meter one from the same Canadian company. Recently, Tim Neethling, built a similar one for her, using exactly the same type of wood and design. Sam Nthlengethwa, Gautrain Station, 2014. Mohair & cotton polyester, 1,5 x 2m. Mags’ work was often exhibited at Goodman Gallery in Johannesburg. It was through Linda Goodman that she met many of the artists with whom she commenced lifelong collaborations. Judith Mason was one such artist. She designed the celebrated Royal Hotel tapestries, commissioned in 1978. These were three meters high and thirty three meters wide, in sections of three meters each. “Judith is a very meticulous person, mostly preferring to develop the cartoon herself,’’ according to Mags. Typically, Mags would do the tracing of an image from the original artwork/design by the artist onto a clear sheet of film, carefully indicating the various colours and their different shades. Judith did all that from the outset: “Probably because it was drawing a drawing again, or making a drawing from one of her paintings, ending with a drawing rather than starting with one.’’ What is of special significance about the Royal Hotel tapestries, apart from the imposing size and the rich symbolism of its imagery, is the fact that Mags and Judith experimented with using the warp threads as part of the final work: these were plaited, knotted, twisted and allowed to fall like half-drawn curtains across the picture plane of the tapestry. Mags met Norman Catherine in 1974 through Linda Goodman and the two began a working relationship that has continued to today. The earliest tapestry was of an intimate drawing Catherine made, based on his experiences as a schoolboy: it was called School Board and comprised deceptively simple stick gures, similar to what one might expect of a very young child. On closer inspection, though, all the humour and playfulness that one associates with Catherine’s work, emerges and the deceptively simple imagery reveals a sophisticated commentary on life. “One of the reasons I particularly like working with Norman,” Mags says, “is because he constantly reinvents himself and he often exploits the latest technology in his art. The latest design I am weaving for him is a computer generated image done with sophisticated software. Each of the colours is separated so there is no overlap. It makes my life much easier.” Later that year Norman introduced Walter Battiss to Linda and Mags, and the two quickly started up a long and successful series of collaborations. Mags was particularly taken with his protracted performance piece, Fook Island that started in the early 1970s. Small wonder that one of the first tapestries she wove for him was of a typical Fook Feast, bought by Pretoria Art Museum at that time. 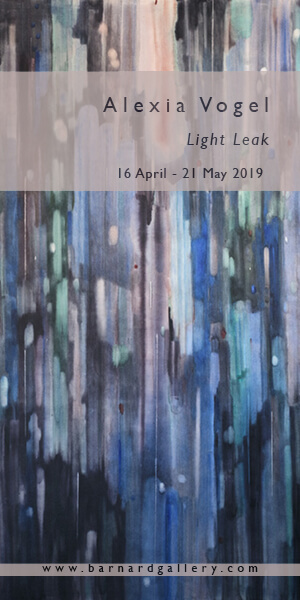 Battiss was a frequent visitor to the weaving studio, and Mags also visited him at his famous Giotto’s Hill house in Pretoria to discuss the progress of various tapestry projects. Sam Nthlengethwa, Backstage, 2014. Mohair & cotton polyester, 2,5 x 3m. Karel Nel led the pack of the new generation of artists with whom Mags collaborated. “I have known him since he was a boy coming to the studio to watch Judith Mason’s tapestries being woven. He spent a lot of time in the studio and when I asked him what he wanted to be when he had grown up, he promptly said: “I’m going to be a museum director and then an artist!’’ The first tapestry she wove based on one of Nel’s designs, was for an exhibition at a weaving symposium in Sydney, Australia in 1987, which was shown at the Melbourne Art Museum. The most exciting project on which Mags collaborated with Nel, however, was the Gencor commission for the new headquarters of the company. She had to weave four tapestries, each twelve meters long by one and a half meters wide, forming veritable banners that were suspended in the central atrium of the building. Nel based his designs on mining cores which meant that hundreds of subtly different shades of earth colours had to be dyed to be used in the tapestry. But more difficult even than that was making the images available visually from both the front and the back. Sam Nthlengethwa is another contemporary artist with whom Mags has had a long and successful working relationship. Their first collaboration was for an exhibition at the Standard Bank National Festival of the Arts in Grahamstown. “Recently I took a very interesting photograph at a new Gautrain Station,” says Mags. “I showed it to Sam and asked if he could use it in one of his collages.” Of course he took up the challenge! Of particular interest is the red jersey in the bottom right hand side of the tapestry, woven in mohair, which regains the texture it lost in the two dimensional photograph. 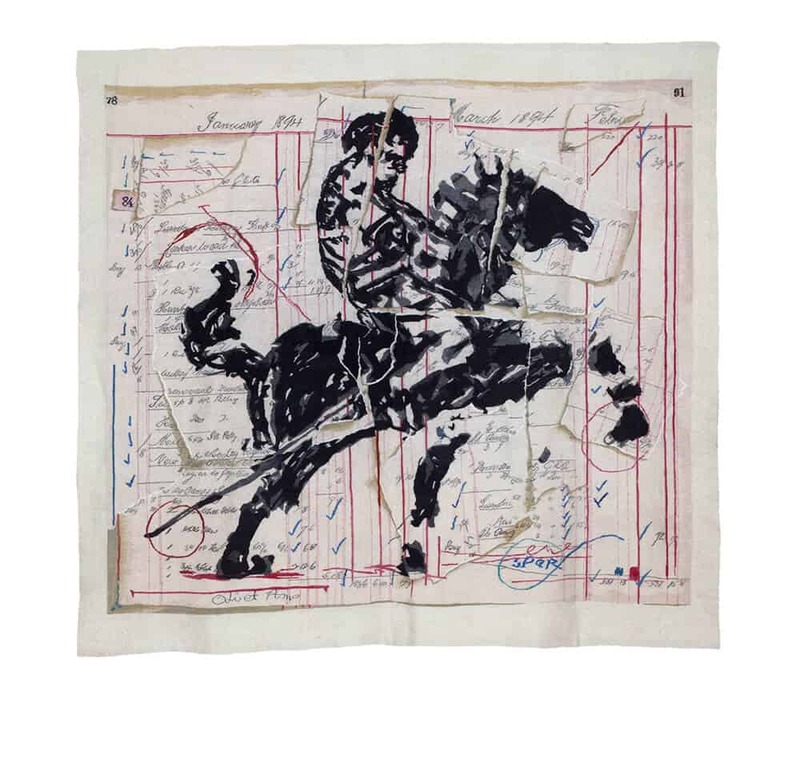 William Kentridge, Roman Centurion, first woven in 2013. Mohair & cotton polyester 1,8 x 1,8m. Photographer: David Ballam. Courtesy of Stephens Tapestries. Robert Hodgins was yet another artist introduced to her by Linda Goodman with whom she worked closely for many years. The tapestry diptych King & Queen was their first collaboration. “We both had such fun working on this project, because Robert would come into the studio, grab a piece of polystyrene, rummage through the needlework baskets, and start cutting up pieces of fabric – batik, felt and upholstery, ribbon – and pin them on the polystyrene, creating the designs for the two works. The playing cards in each image were from a card game of the night before. Imagine having to weave a design made of textile in the very tactile medium of mohair, and having to make it look like the representation of a textile as well! What Hodgins particularly liked about tapestry, was the effects one could get by mixing or blending two strong colours in one weft. The colours bleed into each other: one yellow and two red threads, or two yellow and one red one made for very interesting lines. He said it was an effect that was impossible to get from oil paint.’’ Mags remembers that Hodgins insisted on being present at the cutting off of his first tapestry. He invited all his friends to celebrate the occasion with him, including William Kentridge and Deborah Bell. And that is how Mags started her long collaboration with Kentridge. The first tapestry she wove based on a Kentridge design, was for the ‘Porter’ series called Man with Chairs in the late 1990s. The ‘Porter’ series ended up consisting of about fifteen tapestries. One of these, Office Love, was commissioned by the Johannesburg Stock Exchange. Carlos Basualdo, from the Philadelphia Museum of Art saw this particular tapestry commission and promptly organised an exhibition at the Museum in 2008. 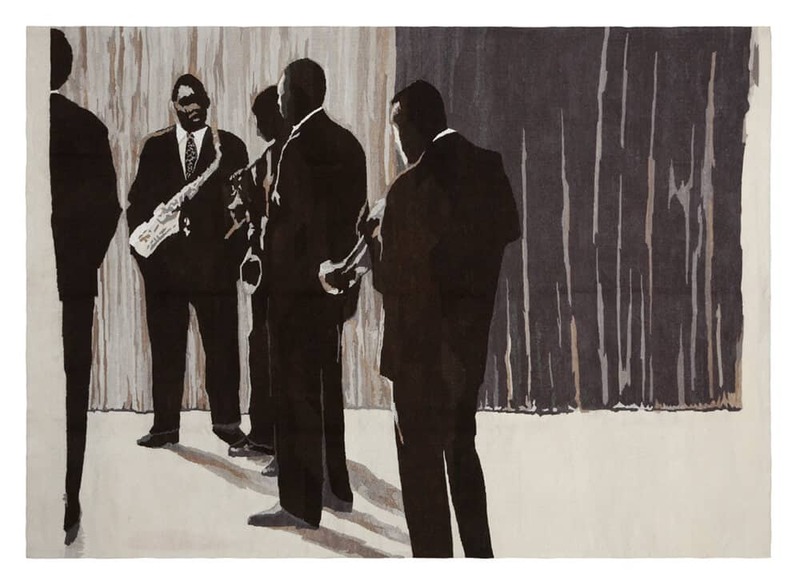 He also, in 2008, published a book, William Kentridge Tapestries, based on the tapestries exhibited at the Philadelphia Museum of Art. William Kentridge, Flowers for Suzanne, 2017. One of three related designs known as the ‘Manet’ series. Mohair & cotton polyester, 2,16 x 1,58m. Photographer: David Ballam. Courtesy of Stephens Tapestries. With Kentridge’s interest in The Nose many more tapestries followed, culminating in a cycle called Streets of the City. These were exhibited at the Goodman Project Space at Arts on Main in 2010 before they were shipped to Naples, Italy. A book, with the same title, accompanied the exhibition. In 2012 followed an exhibition of the ‘Porter’ series, this time packaged under the title: ‘Will you join me at the ball?’ at the Centro de Arte Contemporaneo in Malaga, Spain. Maria de Corral curated the show in a unique way by placing selected sculptures by Kentridge in close proximity to his tapestries. 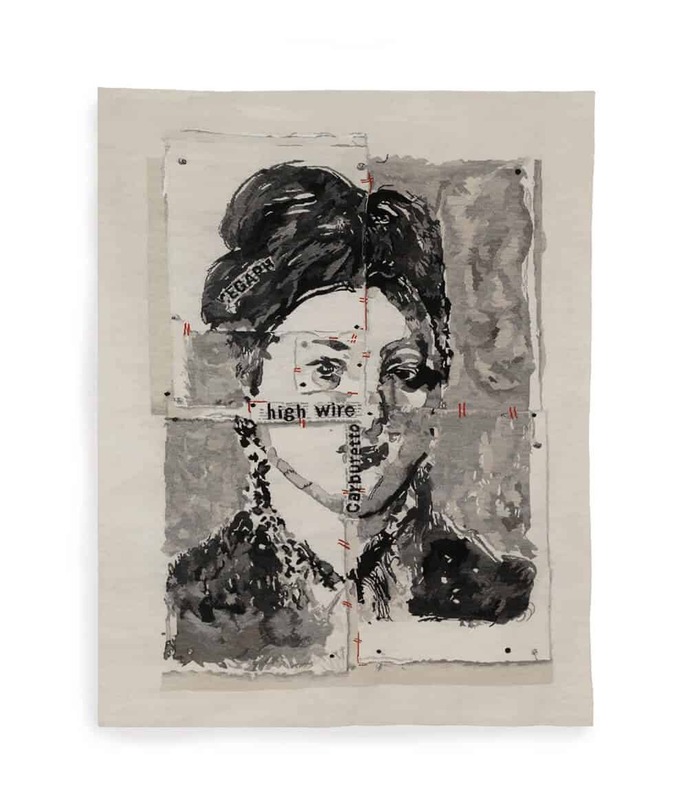 “What I particularly liked about these works,’’ Mags says, “is the fact that Kentridge pays subtle homage to Picasso in the tapestry designed particularly for this exhibition. Malaga is Picasso country: he was born there and his father taught at the local Art Academy. Kentridge integrated Picasso’s famous Bird of Peace and the Guernica light in the tapestry’’. 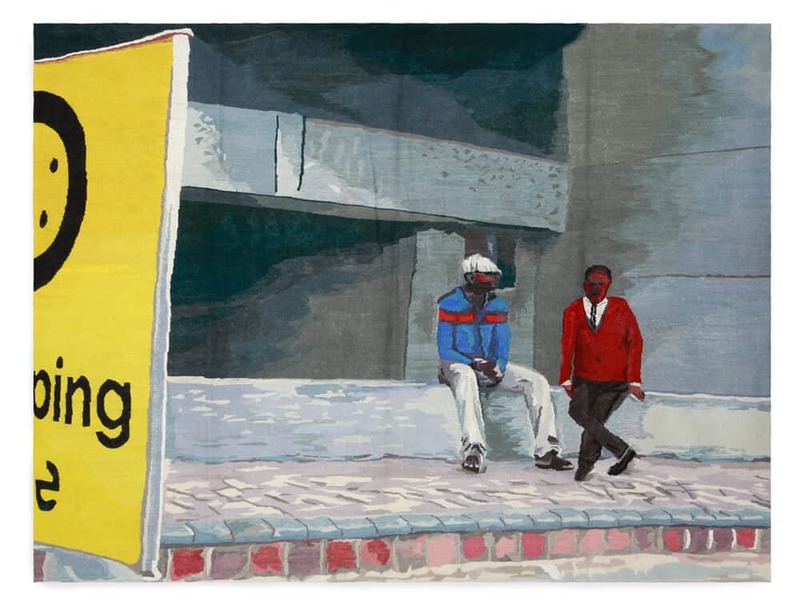 Arguably the jewel in their collaboration crown has been the comprehensive exhibition of Kentridge tapestries at Wits Art Museum in 2014 showing a fair number of the Kentridge tapestries she has woven for him. 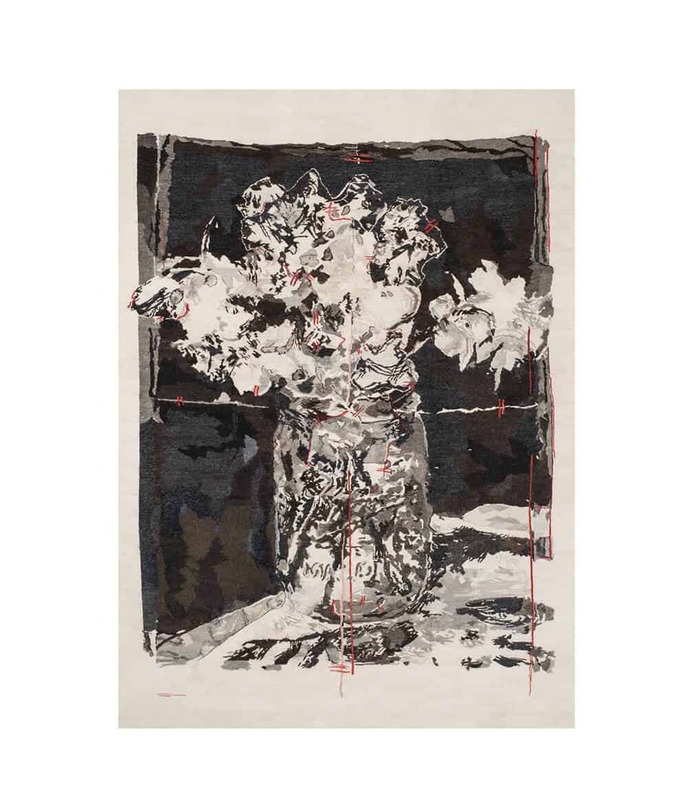 The latest work Kentridge and Mags have collaborated on together is a series of tapestries that explore the impressionist painter, Édouard Manet. “William works extremely quickly and is used to collaborating with other craftsmen. It came naturally to him to work with the weavers. “His collages, which involves torn paper over which he draws and paints, is like the “choreography’’ of the hands of the weavers when making tapestries.” Kentridge’s many “projections’’ might appear fleeting in nature: they are as much of erasure as they are of assemblage. But in his tapestries, the images virtually become frozen projections. In addition, Kentridge, it can be argued has always been interested in the notion of portability, and the tapestry, his tapestries, has the propensity to be folded up and unrolled, like a carpet, or hung like a wall covering in a new context. This is what makes Mags such a masterful tapestry weaver: she can interpret the vision of the artist expertly and translate it into a tactile medium with phenomenal result. Wilhelm van Rensburg is a lecturer, curator, and the Co-Founder of the former Gallery Art on Paper. Van Rensburg is currently working as an art expert at Strauss & Co. Fine art auctioneers and consultants.